My birthday, Nate's birthday, tradition, Christmas, family, good food, cheer to last us a lifetime. I love it. Tonight I'm wishing you all a month of love. Cozy nights, deep breaths, warm hugs and family and loved ones near. Wyatt says happy holidays too. 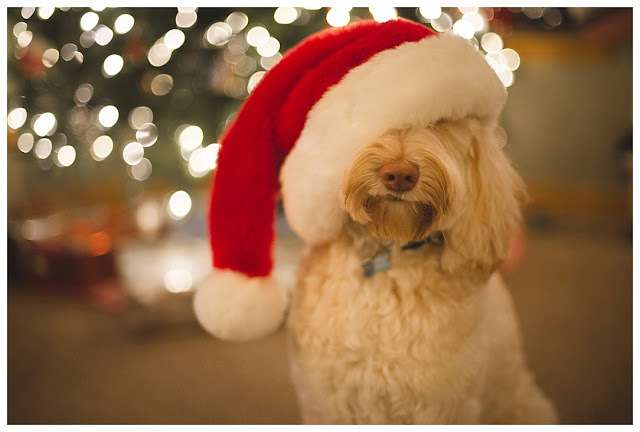 He is so obedient, even when I tell him to sit and wait and he has a santa hat covering his face!!! But God help us all if he steals a sock and we want it back...hello Cujo!